A dispute over guidelines for lawn ornaments has created a major flap in one Coeur d'Alene neighborhood. One that has had two sides of the issue pecking at each other for over a week now. At least one side is seeing red. Both sides are seeing pink. Jeanie Brereton, a resident of Harbor View Estates, thought the homeowners association's rules requiring approval for yard ornamentation were a little too arbitrary. She thought a few of the classicly-tacky American pink flamingos would provide a jestful jab at the Architectural Committee, which administers the design covenants of the Kidd Island community. So she put a little flock of them in her yard, peeking out at passersby from behind the iron fence. Many of her neighbors loved it, she said. "They'd honk and wave when they drove by. It made them smile." On June 10, Brereton and her husband Dan were sent a letter signed by property manager manager Douglas Mayo. "I have recently noticed the flamigo's [sic] in your yard," said the letter in part. 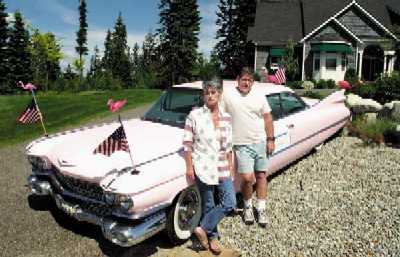 Eldes and Ken Johnson stand next to their pink Cadillac decorated with American flags and plastic pink flamingos in front of their home in Harbor View Estates near Kidd Island Bay. They were advised that approval or removal by June 30 was required to comply with the covenants of the association. She replied with a letter to the association regarding the "Flamigo's." "My best guess would be that this is, in fact, a hybrid of the highly sought 'Flamingos' seen migrating North and West throughout Harbor View Estates. "Since these are actually migrating 'Flamigo's' not permanent 'Flamigo's,'" the covenants do not apply, she wrote. Since then, said Brereton, many of her neighbors have joined in the battle of the birds, erecting their own flocks of flamingos throughout the neighborhood. It's a protest against what she and others consider as overzealous enforcement of the upscale Kidd Island community's covenants. Betty Sederling, another resident of the area describes some of the neighbors as "a little Gestapo," reporting the most minor infractions of covenants to the board. "It's ridiculous up here" she says of the friction in the neighborhood. She and her husband Lars, a retired Culver City, Calif., police chief, have four of the birds on their lawn and another pair on a vacant lot they own, she said. Asked where they're finding so many of the birds, she said, "The 50 Percent Off Card Store. They're going to have a good year." Ken Johnson also ran "afowl" of the board, he said. In 1998, he was told he needed to provide better screening to hide his propane tank from view. He put in a fence with an arbor and vines, he said, and was later commended in the community newsletter for the results. Then, a month ago, he was advised his screen was not up to standards. "That's the way they work," said Brereton, a former member of the board. "After the general membership meetings, the board members sit around and decide who to harass next. I quit. I wouldn't be part of that." Mayo offered no comment on the situation, referring questions to association president Mike Anderson, who resides in the community. Though they face possible fines, Anderson said, none had been levied for any recent infractions. "This is just one or two disgruntled members," he said of the growing flock joining Brereton's cause. "A number of people here don't care for them," he says of the flamingos. "We're just enforcing the covenants. Section 3.11 says yard ornaments must have prior approval of the architectural committee." Meanwhile, Johnson has converted his pink Cadillac into the neighborhood "Flamingo Patrol," decorating it with more of the famous flamingos. And, says, Brereton, other members of the community have agreed to pay the $35 per month fine the association can levy if they choose. And the flamingo flocks have fanned out around the neighborhood, with nearly a dozen so far. "We're sick of people bossing us around," Brereton said.